Felt is a mass of matted raw lamb's wool. Felt is Imported from New Zealand, this raw felt wool is first carded and then dyed into different colors as desired in different forms for the final product. The type of dye usually used is Swiss dye. Felt products are purely made by shaping the felt raw wool with soap and water and human hand pressure, no chemicals are used during this process. Thus shaped felt product is dried under the sun. Due to felt unique manufacturing process, any desired shape can be created. As the felt products are relatively simple to make, lot of under privileged women have become involved in this industry. This in turn has helped in improving their living standard and empowered them. Upon completion of the coloring process of the felt our skilled workers (mostly womens); start compressing the raw material by hand with washing soap and hot water. After continuous hardworking on compressing; the wool(felt) will formed into patches that can be sewn together or made directly into bags, hats and shoes. Patterns can be added to the felt at this stage by rubbing different colored wool into the base sheet with soap and hot water and integrating the fibers of the two to produce the pattern. Very fine and attractive designs can be produced in felt as the workers pay great attention to detail and are highly skilled. When the felt product is formed and designed it must be sun dried. After drying felt, some extra work such as sewing or additional decorating is to be done. The product of felt is then finished and ready for sale. 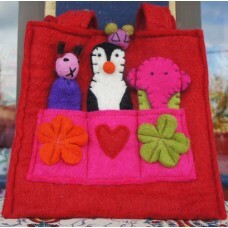 Woolen felted bags are being very popular fashion items due to their customizable sizes, colors and styles. Just imagine any design and get realized it in a day; our over 20 different colors can make your style possible by our very professional hands. Whether it is a formal office file bag, a fashionable ladies shoulder bag or even a Lama (monk) bag. Nepal Mithila Women Handicraft can avail all kinds and taste of felt bags those are entirely made by hand in Nepal. Not only you are buying our felt bags, you are supporting our marginal people buying these beautiful bags through Nepal Mithila Women Handicrfat. Felt is the oldest form of fabric known to humankind. It is obtained through the interlocking of wool, fur, or some hair fibers under conditions of heat, moisture, and pressure. This raw wool is first carded and then dyed into different colors as desired in different forms for the final product. Felt products are purely made by shaping the raw wool with soap and water and human hand pressure, no chemicals are used during this process. Thus shaped product is dried under the sun. Due to Felt unique manufacturing process, any desired shape can be created. We offer a wide range of fine quality Nepalese Felted Bags which are fashionable and trendy as per today requirements. Like felted wool shoulder-bags, Felted baby Bag, felt Passport bag, Felted Coin Purse, Etc . We have years of experience in making fabulous and fashionable felt bags. we can make up any small felt bag or purse to your individually specified design, style in your choice of colors. They make wonderful and very memorable gifts for people of all ages. Let your imagination go and send us any design of felt bag and we will apply our wealth of experience to the realization of your own idea. Unique Creative Export manufactures different kinds of felt purses for different purposes such as money purse, felt pencil purse and many more. You can choose your own color and design too. Dream up and send us your own design and we will be happy to create them for you in Felt. We have years of experience. Trust us. Felt Coin Purse comes from a producer in Kathmandu, Nepal, where women are able to use their craft skills to provide a generous income for their families. Felt is hand made in Nepal. The perfect mixng and matching of felt make more interesting. Felt products carries a wide variety of accessories like colorful felt pom-poms, key ring, bracelets or felt bangles, necklace, earrings or even felt tea mats, all are being made and exporting to the different region of the World. Here we offer different design handmade felt hair bands. Choose or imagine any design of hair bands and ask us for color chart to customize, we will be happy to create your own design in felt based on our years of experiences. Felt from Himalayan of Nepal. It is a wonderful bag that is made with the main aim of satisfying children. It is available in diff..